Our newest addition to the hugely popular Pennsylvania Broadleaf line. My favorite email regarding a customers experience was: "This cigar is like smoking a chocolate bar". Hahahaha....a very good description indeed! GROWN IN THE USA! Low and slow...the only way to ferment a Pennsylvania Broadleaf to taste like ours. If you like a full bodied, strong cigar with an incredible taste, you must try the Wild Thing. A truly unique cigar with incredible depth and astonishing highs. The flavors continue to unfold through the entire burn. It is fantastic! 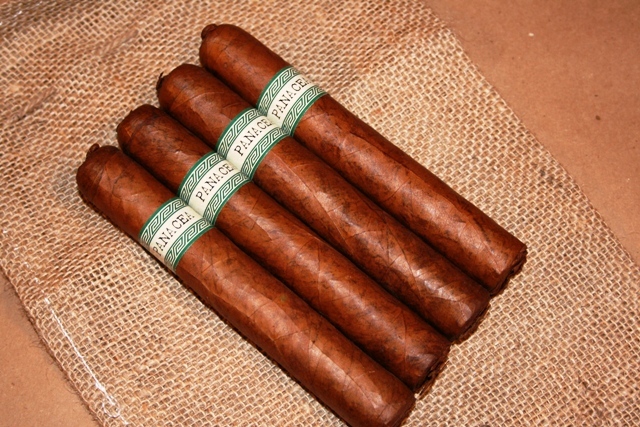 A triple Ligero (Piloto Cubano, Olor Dominicano, and Nicaragua) wrapped in the most beautiful PA Broadleaf with a twisted cap and unfinished foot. A Cuban seed binder (grown in the Dominican Republic). Grande 660 (6x60)....Wild Thing. Loved the black, cannot resist the red and now I am hooked on the green...have yet to find one of these blends that is not beyond great!